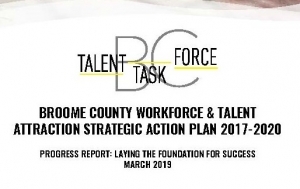 BINGHAMTON, NY – The Broome Talent Task Force, a collaboration of industry, education, economic development and non-profits, released a report on its progress to address critical workforce development and talent attraction needs in Broome County. The report highlights the objectives established in the Broome County Workforce & Talent Attraction Strategic Action Plan 2017-2020. The progress report highlights the process the group conducted to develop a workforce strategy, as well as successes from the first year of plan implementation. The report also outlines the goals and objectives for this year’s efforts, which includes pursuing funding for programs through monies allocated to workforce development by New York State. “I am very proud of the work that we done as a community,” said Paniccia. “We are building a vibrant workforce and strengthening our talent pipeline and telling our young people that we have valuable opportunities here in Broome. Some of the highlights of the Progress Report includes the launch of a “there are jobs” campaign as part of the Broome County Good Life program; the creation of a state-recognized Warehouse Opportunity Impact Program; and the Greater Binghamton Education Outreach Program (GBEOP) launched the Your Futures website to link students, parents, educators and industry to job and internship opportunities.